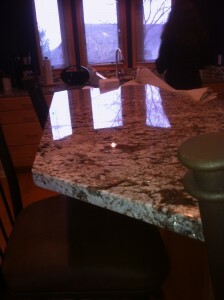 December 2012 - Granite, M.D. 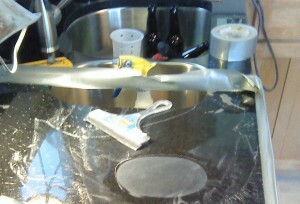 Granite seam to be repaired. 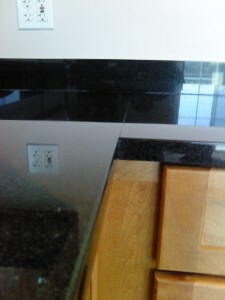 Granite seam repaired. This entry was posted in Photos on December 6, 2012 by karri. Identifying repair area. 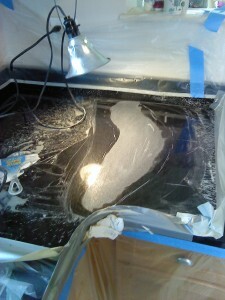 In the repair process. 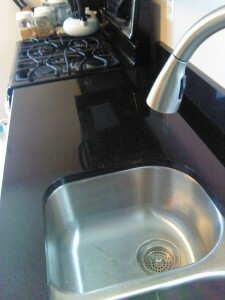 Absolute Black granite seam repaired. 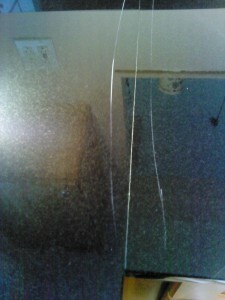 Identifying scratches. In the process of repairing scratches. 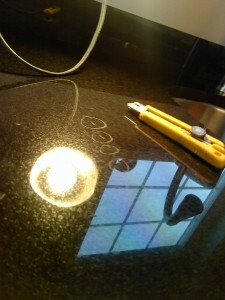 Absolute Black countertop cratches repaired. 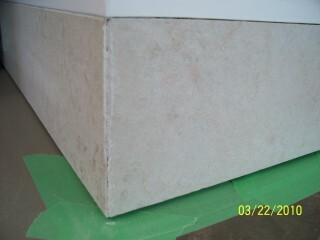 Limestone baseboard to be repaired. Limestone baseboard repaired. 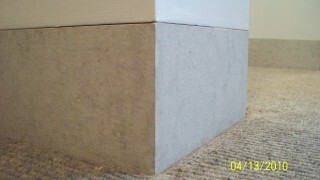 Specializing in the restoration and repair of natural stone surfaces. Granite, M.D. is Northern Michigan’s source for restoring, repairing and maintaining the beauty of your natural stone and concrete surfaces. We service the upper and lower peninsulas of Michigan. 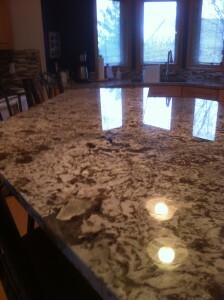 We restore and repair countertops, flooring, walls and showers that have been scratched, chipped, cracked, damaged or dulled, countertop seams, under mount sinks that have fallen, remove and repair stains and etching, clean, caulk and reseal surfaces, hone polished surfaces, drill holes for water purification systems and resurfacing flooring, to their original installed look and feel. We take special care of your belongings, cabinets and flooring by using tape, plastic, and tarps to mask anything that we, our products or water and dust may touch. We also design and install, from our vast selection of granite countertop remnants, mosaic flooring, interior walls, exterior siding and exterior retaining walls. This entry was posted in Uncategorized on December 5, 2012 by karri.